We specialise in both private lessons and public groups. Whether you have a private or join in a public lesson, we always only have small class sizes, so that you get heaps of individual attention from our coaches to help you learn quicker and better. 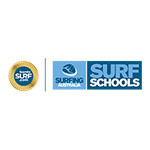 Our surfing lessons are suitable for men and woman, boys and girls, of all ages & all abilities. Our comprehensive surf lessons usually last for 1.5 hours (90 mins), and include instruction on sun & surf safety, learning about the ocean and waves, how to surf (and how to surf better! ), selecting the right surfboard, and the Rules of Surfing. 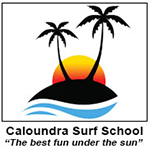 Caloundra Surf School provides all the equipment for your surfing lesson. Just bring a hat, towel, sunscreen (I’ll also supply free sunscreen from the Cancer Council Queensland! ), and your smile! We will supply a clean, fresh rashie for you to use, and a wetsuit if necessary. Do I need to wear a wetsuit during my lesson? We are so lucky on the Sunshine Coast that it rarely gets very cold in the water. Did you know that the water temperature is actually a lot warmer up here than even on the Gold Coast, which gets some very cold currents flowing past from down south! But when it does get cooler, we do provide WETSUITS for our students when necessary. 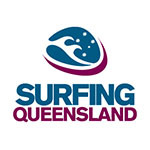 The Sunshine Coast is a very pleasant place to learn to surf all year round! Our main concern is the danger from too much unprotected exposure to the sun. 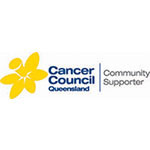 At Caloundra Surf School, we work closely with the Cancer Council Queensland to make sure our students understand how to surf “Sun Safe”. This is a very important part of our learn-to-surf program. As part of your lesson, we will also provide you with free sunscreen and information about how to be “Sun Safe” on the beach and in the surf. A private class for 1 person is $110; $80 each for 2 people (total = $160); $70 each for 3 people (total = $210); $60 each for 4 or more people. We can even arrange to take pictures or capture your surf lesson on film! Not sure what to get someone for Christmas? Why not give them a surf lesson! What a great Birthday or Chrissy present for someone special! Do you want to get started or need more information? Fill out the form here, or Contact John via phone or email.